Why use only DuPont Teflon Bearing Grease? With proper care and lubrication, S and S Couplings should outlast your frame! Why use only Finish Line™ Extreme Fluoro Grease? We have been testing lubricants on couplings, screws, nuts and bolts now for about 15 years and Finish Line™ Extreme Fluoro Grease is without a doubt, the best product that we have ever tested for use on S and S Couplings. The only drawback is that it is expensive. I frequently get e-mail from people telling me that they want to use another type of grease commonly found in bike shops or automotive parts stores. While we haven't tested every product out there, we have tested quite a few lubricants and Finish Line™ Extreme Fluoro Grease is light years ahead of everything else we have tested. Finish Line™ Extreme Fluoro Grease is the only grease that we have tested that is colorless so it's less likely to stain cloths, is thick enough to not run off the threads and it excels in our lubricant test.. We have listed all the products that we've tested below in the tables in the order of how well they performed with the best products at the top. When you take a look at the results, you will know why feel so strong about specifying Finish Line™ Extreme Fluoro Grease. If you look closely at the results in the tables below, you will see that some products actually perform worse than no lubricant at all. Why is DuPont Teflon® Bearing Grease so hard to find? DTBG was discontinued as a bicycle grease several years ago. When we found out that it was being discontinued, we stocked up on it so we would have a temporary supply for our customers. Now that our stock is gone, we are stocking Finish Line Extreme Fluoro which is made specifically for us by Finish Line from the same 100% pure DuPont fluorinated ingredients used to make DuPont Teflon® Bearing Grease. In our tests, Extreme Fluoro performs as well as DuPont Teflon® Bearing Grease and for our purpose, we consider it to be equivalent to DuPont Teflon® Bearing Grease. Finish Line™ Extreme Fluoro Grease is available though any of the framebuilders or retailers found on the S and S web page. Although they may not stock it, any framebuilder on the list or you can order it direct from us. DuPont also makes a product called Krytox®. We were told by a DuPont engineer that for our application, Krytox® will work the same as DTBG since the formula is very similar. Our tests of Krytox® support their claim. Krytox® is typically sold through industrial distributors so it may also be hard to find and like Finish Line™ Extreme Fluoro Grease, it's expensive. Why do we bother to include so much information about Finish Line™ Extreme Fluoro Grease? Many people seem to be skeptical about the need to use only Finish Line™ Extreme Fluoro Grease on their coupling threads. We have included our testing method here because it's the best way we know of to convince our customers that not all grease is the same. For example, I was talking to a framebuilder a few years ago at a bike show and I was explaining the importance of using only Finish Line™ Extreme Fluoro Grease on S and S Coupling threads. He responded by rolling his eyes back in disbelief saying "come on, grease is grease". That wasn't the first time I had heard a comment like that so I invited him to come to my booth for a demonstration so he could see for himself how different grease can be. He accepted my offer so for starters, I set up the portable grease testing device and had him pick from a variety of popular greases that I had with me (he picked white lithium grease). I applied the grease to the screw and placed the screw and nut in the tester to the point that it was ready to begin the test. I had him turn the wrench. The screw rotated a turn or two then started to turn with a jerking motion and made some creaking noises then suddenly it froze in place. As he continued to try to turn the screw, it twisted off. Then I had him repeat the same test but this time with DTBG. He was amazed at how how smoothly and easily the screw lubricated with DTBG turned and how it continued to turn without breaking. He turned the screw down 10 turns then up 10 turns etc. He kept turning the screw up and down over and over again. I told him that he could probably turn it all day long and never damage the screw or nut. Soon, he got tired of turning it and quit. Then I told him about how many products that I had tested and how I hadn't been able to find anything that would last even 10 turns. I also offered to let him test other products but he passed. He was really amazed and easily convinced to use only DTBG. Unfortunately, I can't give everyone that first hand experience but I can do the next best thing which is to show our customers the test procedure we use and the results which will hopefully, be convincing enough. What properties do we look for in a lubricant? Lubricating properties: Couplings made from exotic metals like stainless steel, titanium and aluminum when not properly lubricated, may develop excess friction or sticking of the nut threads during the final tightening. That sticking can give the person tightening the nut the impression that the coupling is tight when really, most of the torque being applied to the nut is going towards overcoming friction and not towards holding the coupling together tightly. For that reason, our number one priority is to specify a product that will allow the nut to turn smoothly without sticking, especially during final tightening. The stickiness experienced during tightening is due to galling. In order to tighten the nut properly, a lubricant that prevents galling is important. Anti-galling properties: Thread galling seems to be the most prevalent with fasteners made of stainless steel, aluminum and titanium. 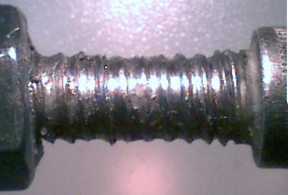 During fastener tightening, as pressure builds between the contacting thread surfaces, galling can occur. Galling is a severe form of adhesive wear which occurs when two metallic components slide against each other at relatively low speeds. With high loads and poor lubrication, galling can cause surface damage characterized by localized material removal or transfer (material from the nut is deposited on the screw or vice versa). The damage caused by galling may occur after just a few cycles of movement between the mating surfaces. Severe galling can cause seizure and costly problems. The best example that I can think of in our daily life, although not scientifically the same, is when a sticky substance, like rubber cement, gets on your fingers and you rub them together to get it off. The cement clumps together in little globs and as you continue to rub your fingers together, the globs get bigger as they pull additional particles of glue from your fingers. Those globs then stick to one finger or the other or even move back and forth from finger to finger. As the process continues, some of the small globs join together to form even bigger globs. When sliding takes place between a nut and screw, material can transfer and clump together in a similar manner on the nut and screw. As those clumps get larger, the force required to turn the nut increases and eventually, the threads are either scored, torn from either fastener or the nut will seize (freeze in place or cold-weld) permanently to the screw. Using the proper lubricant keeps metal particles from transferring and keeps globs from forming. Looking back at the example of something sticky on our fingers, if we put grease on our fingers over the rubber cement before we rub them together, globs wont' form and the glue will stay put. Lubricating threads with DTBG works is a similar manner. When it is applied, material doesn't transfer and clump together so the threads are undamaged, even with frequent use. 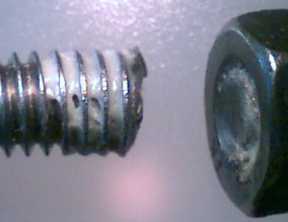 This screw was lubricated with white lithium grease and clamped with relatively light pressure. This test demonstrates how destructive thread galling can be over time, even if the screw doesn't seize. 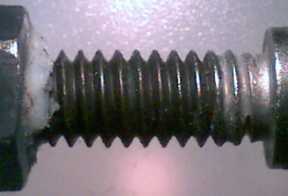 This screw was lubricated with Never-Seez and it lasted for 9 revolutions. The threads are badly deformed and one thread was torn away. This screw lubricated with DTBG, now Finish Line™ Extreme Fluoro Grease, turned over 200 revolutions without any galling or seizing. A new photo of a tests actually done with Finish Line™ Extreme Fluoro Grease is coming soon. This test of 1000 revolutions shows no sign of thread damage. Anti-seizing properties: Seizure is the stopping of relative motion as the result of interfacial friction. Local solid-state welding (cold-welding or freezing together of the threads) may be a part of the mechanism of seizure. This wear process does not necessarily require progressive loss of material. As mentioned above, seizing can be the result of galling. When we conduct a grease test, it almost always results in the screw seizing to the nut which causes the screw to break off which ends the test. This nut and screw seized (cold-welded) together and stuck. As we continued to turn the screw, it broke. This is the most common result of our test. Lubricant must stay put: Semi-solid, paste or grease like consistency is important so the lubricant will stay on the threads over a long period of time. Some oils and sprays may provide good lubricating properties but when applied, they tend to gradually flow away from the threads. If the lubricant doesn't stay on the threads, it may not lubricate the coupling properly over an extended period of time. Should be colorless. : We like clear or colorless products best since they are less likely to stain hands and cloths. Some anti-seize compounds like Never-Seeze and Finish Line Ti-Prep don't come close to the lubricating properties of Finish Line™ Extreme Fluoro Grease but they are better than most of the lubricants we tested. Both of those products might work OK in a pinch but they tend to be very dirty. They contain powdered metal particles so the grease will stain cloths and generally make a mess of whatever they come in contact with. Since many people like to put their cycling clothing in the case with the bike, it's a good idea to use a product that is less likely to cause trouble. How do we test lubricants? Objective: Our test is very specific to determine how effective various products are at reducing the tendency of stainless steel threads to gall and seize under extreme pressure. The pressure we use exceeds the loads encountered during normal tightening or loosening of S and S Couplings. We do this to simulate what happens during the final fraction of a turn during the tightening of a coupling nut. These test results don't tell us anything about how well these lubricants will perform in other applications. Don't be tempted to apply our findings to ball bearings or other situations where galling isn't a problem. If you write to us asking how this grease will work in another application, we will tell you we don't know. We only have the results of this test and that doesn't tell us how well it will work in your fishing reel, gun, motorcycle spline or anything else. Overview: We count how may times we can turn a lubricated stainless steel cap screw that is threaded into a stainless steel nut (the nut is squeezed tight on the screw in a special fixture) until the screw breaks or reaches 1000 revolutions. 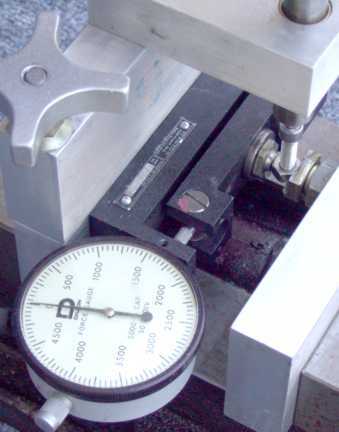 This photo shows the test fixture mounted in a milling machine vise. The crank support is shown in the open position which makes it easier to load the screw and nut in the fixture. After the nut is in place, the crank support is swung back over the screw and is clamped in place. Step 1: e completely fill all the threads of a 1/4" x 20 stainless steel cap screw with the lubricant to be tested. Step 2: Screw the cap screw into the nut until the screw is all the way through the nut and flush with the back side. Step 3: The nut is then squeezed in the fixture until the clamping force reaches 4000 pounds. This screw and nut is shown in this photo without grease. 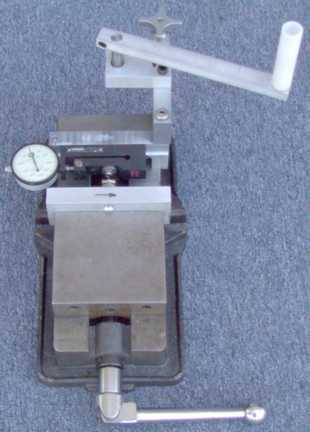 The Dillon Model U Force Gage allows us to apply exactly 4000 pounds of force to the side of the nut. The nut and cap screw are accurately held in a nest so the force gage always applies pressure in the same place on the nut. Step 4: The screw is then turned clockwise until it seizes and breaks or until it has been turned 10 revolutions. This screw broke in under 2 turns. 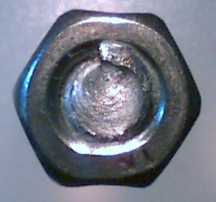 The round indentation on this nut flat is from the domed pressure fitting on the force gage. Notice that the indentation is accurately centered on the flat so we can get repeatable results. Step 5: If the screw makes 10 revolutions without breaking, the direction of rotation is reversed and the process is repeated for 10 more revolutions. Step 6: The process of going up and down ten turns at a time is repeated until the screw breaks or reaches 1000 revolutions. 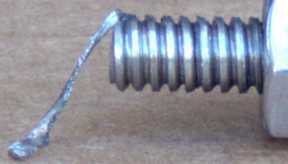 Step 7: The number of turns that the screw turns is recorded and used as that product's score. 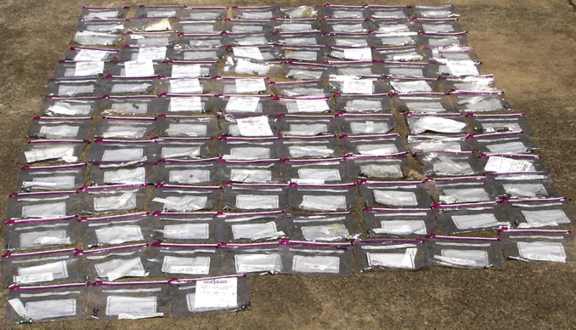 Plastic bags identified with the lubricant used and the test results. The test nut and bolt or bolt pieces are inside the bag. A screw lubricated with Finish Line™ Extreme Fluoro Grease wouldn't break regardless of the number of times it's turned (We quit at 1000 turns). The threads will burnish slightly and become smooth yet they retain their form and function. Once the force is taken off the nut by removing it from the test fixture, it can easily be turned by hand. 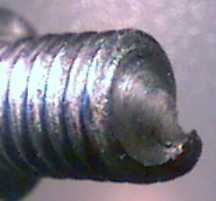 A screw lubricated with Finish Line Teflon Grease broke at 1 and 1/4 turns. How does Finish Line™ Extreme Fluoro Grease rank compare to other products that we tested? The tables below show how many turns each screw lubricated with a different product turned before it broke. As you can see, the Finish Line™ Extreme Fluoro Grease and it's related products like Krytox® lasted for 1000 turns before the test was stopped. The threads tested with those products showed no sign of wear and the force required to turn the crank was minimal. One other product, SFR oil fortifier, also lasted 1000 revolutions however it's an oil so it's likely to run off the threads over time. It's also brown so it may be more likely to discolor clothes. Other SFR products didn't do very well. This is a photo of our test fixture and some of the lubricants that we retested. Caution Caution Caution! These test results don't tell us anything about how well these lubricants will perform in other applications. Don't be tempted to apply our findings to ball bearings or other situations where galling isn't a problem. If you write to us asking how this grease will work in another application, we will tell you we don't know. We only have the results of this test and that doesn't tell us how well it will work in your fishing reel, gun, motorcycle spline or anything else. Just because a product doesn't perform well in our test, does not mean that it is a poor lubricant. We use many of these products ourselves for a variety of applications and they work great. Likewise, just because you have had good results using some of these products in other applications, doesn't mean they are suitable for couplings. These three products provide excellent lubrication, they stay put and are light colored. This product provides excellent lubrication but it's an oil so it may run off over time. It's light brown color could stain clothing. These products might work in a pinch but they may run off or stain clothes. These products do a questionable job of lubricating stainless steel threads and they may run off or stain clothes. Although these lubricants my be excellent in most applications, we don't recommend using them on S and S Couplings. Everything below this point performed the same or worse, in our test, than no lubricant at all. Caution! (please read this before you write to us asking about other uses for this grease! These test results don't tell us anything about how well these lubricants will perform in other applications. Don't be tempted to apply our findings to ball bearings, bushings, slides, gears or other situations. If you write to us asking how this grease will work in another application, we will tell you we don't know. We only have the results of this test and that doesn't tell us how well it will work in your fishing reel, gun, motorcycle spline or anything else. Just because a product doesn't perform well in our test, does not mean that it is a poor lubricant. We use many of these lubricants ourselves for a variety of applications, other than S and S Couplings, and they work great. Just because you have had good results using some of these lubricants in other applications, doesn't mean they are suitable for S and S Couplings. If you need to purchase grease, please contact S and S Machine or one of the retailers or framebuilders or retailers Listed on the S and S web page. We are always interested in testing new products. If you have a product that you would like us to test, let us know and we will test it . We only test products come to us in a factory sealed container accompanied by a MSDS (material safety data sheet). Our lubrication testing procedure was revised 7-04. We also increased the number of revolutions from 200 to 1000.